Good morning. Today I am sharing my contribution to the Colour Challenge this month. I am just loving these colours. Did you catch any of the shows recently on The Craft Channel where Lesley demonstrated the use of Angelina fibres? The butterfly stamps are just perfect for this technique. I coloured a decorative card blank and tag with spray inks and made the floral embellishment from the waste pieces. 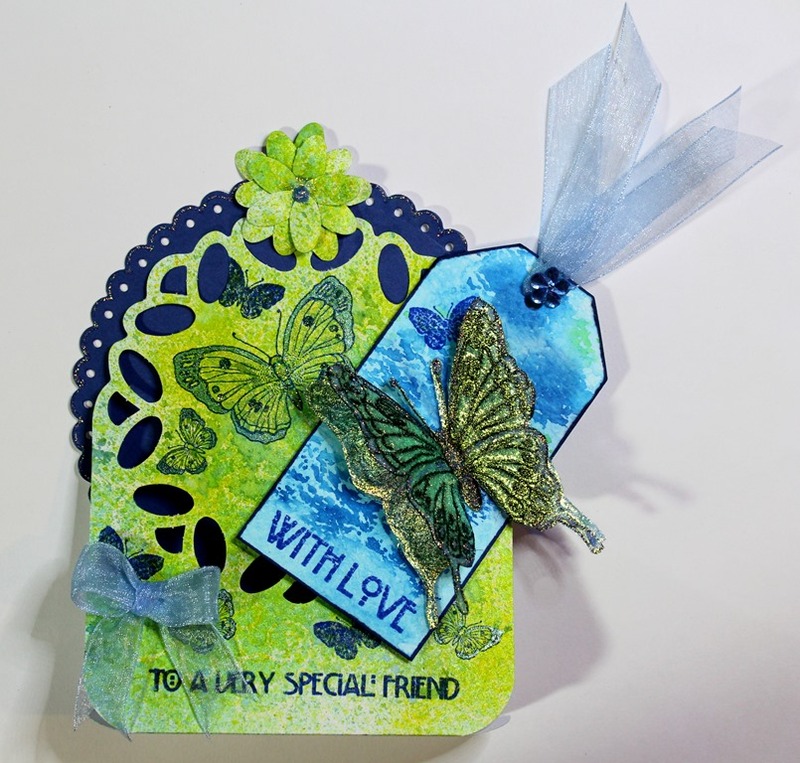 I used stamps from Just Butterflies, Butterfly Blush and Mackintosh Sentiments stamp sets. The sparkling 3D butterfly was created by inking the stamp with black ink, overlaying with Angelina fibres and baking parchment, then ironing briefly on a hot setting. Note: Lesley recommends Black Archival Ink (Ranger). Mine did not work too well. However, I did manage to rescue it using a fine tipped alcohol ink pen to redraw my rather faint image. I used a die cut scalloped circle (dark blue), ribbon, faux gems and glitter glue to finish. Spritz the tag with light and dark blue inks. Stamp the sentiment with dark blue ink. Edge the tag with alcohol marker to frame. Spritz the card blank with green, light blue and yellow inks. Note: I thought that the waste elements would make lovely petals. I left them in place while spritzing then used them to make a 3D flower. Alternatively you could spritz a ready-made paper flower to match. Stamp the butterflies and sentiment with blue ink. Colour with glitter pens. Ink up the large butterfly with black ink and overlay with Angelina fibres. Cover with baking parchment and iron on a hot setting without steam for a few seconds. If using the recommended Archival Ink you should see the image appear through the parchment – it will then be ready. Peel away from the parchment and trim out the butterfly. I made a bit of a mess of mine! I used Memento ink and it left a fairly feint image. To rescue it I used a fine tipped black marker to go back over the image and make it more visible. I made 2 butterflies to layer up. Add a dark blue scalloped circle behind the decorative card front, add a ribbon and bow, glue everything together and finish with glitter glue. This entry was posted in Brusho and Ink Spray, Card Making, Chocolate Baroque, Paper Crafting, Stamping, Tags, The Craft Channel, Tonic and tagged Butterfly Blush, Card Making, Chocolate Baroque, Just Butterflies, Mackintosh Sentiments, Stamping by annewaller. Bookmark the permalink. More with the Just Butterflies and Butterfly Blush stamps featuring on Hochanda today (Freeview Channel 85). I love these stamps so much.